It's been a while since I did some colouring with my copics, then Kaaren from FatCats sent me this lovely Sarah Kay stamp to play with so had to ink her up right away. The lovely die I have used is the Marianne Creatable large oval die, the leaves are also Marianne Creatable dies as is the fence (which seems to be out of stock). The flower is a purchased one (I know shock horror) but I really bought them so I could see how to make them myself. 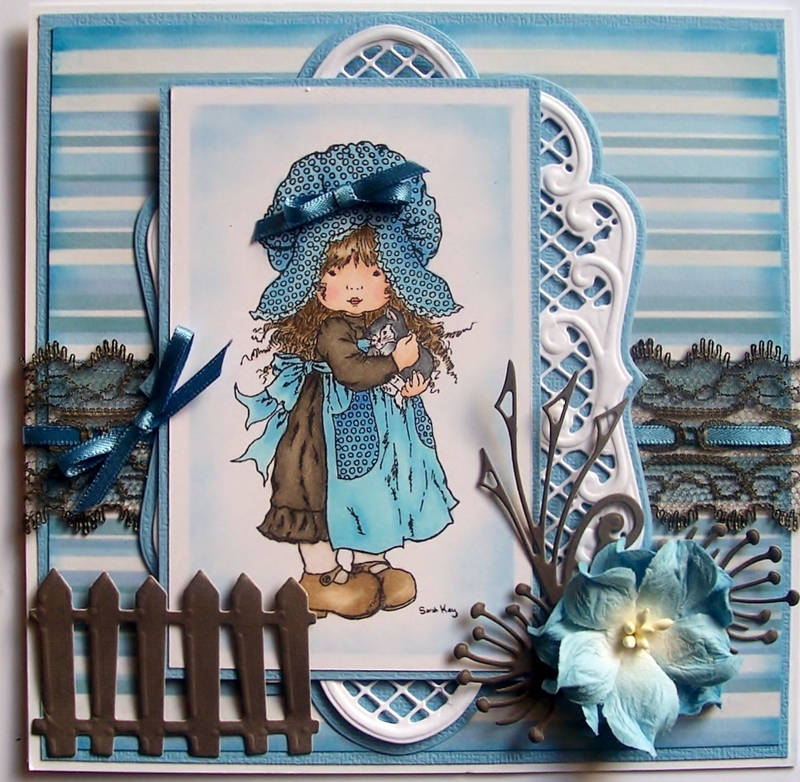 The lace is from my sewing stash and was white but I coloured it with a copic to match my card. I thank you for taking the time to visit and having a look and maybe leaving a comment I do so love to read them. I've been so neglectful of my Blog for which I apologize. We did go away for just over a week though to check up on hubby's elderly parents who had been feeling a little under the weather. The cards below I made for two of our grand children who are both turning 13 this month, a day apart in fact. For Billy I did a paper embroidery card while in Adelaide staying with my sister in law. 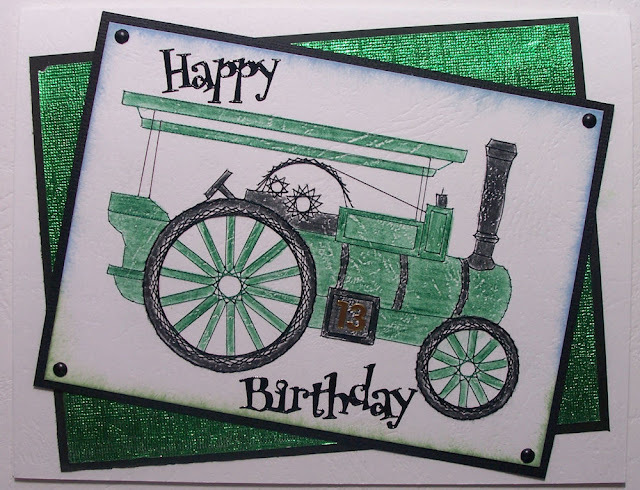 I stitched the steam engine onto white leather look card stock and then coloured it in, I quite like the textured look it gave me. A few brads and some green wrapping paper and my card was finished. For Aimee's card I decided to use a large letter A and then made up the background using all words I could think of that started with A and meant your Awesome or cool. 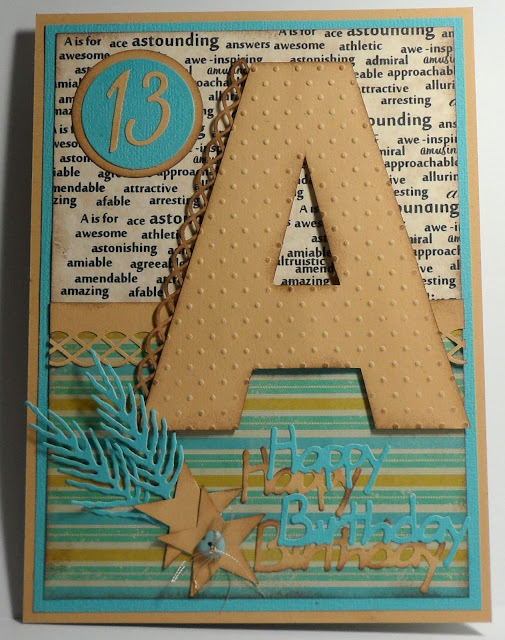 I ran the letter A through the Swiss dots embossing folder and the border running down the side is the Martha Stewart string lace border punch as is the strip going across the centre of the card. A couple of punched stars (Fiskars squeeze punch) sewn on with a little heart button. Leaves and Happy Birthday are Marianne Creatables dies. Everything was distressed with Memento Rich cocoa. Thank you so much for taking the time to visit, I really do appreciate it. 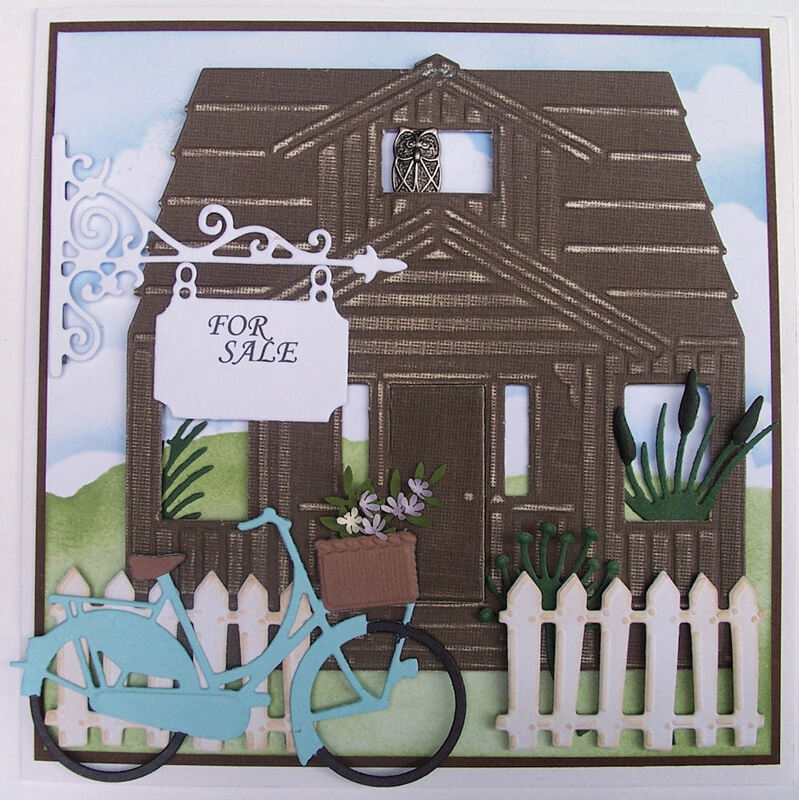 I've had fun playing with the new Marianne Design Craftable Scandinavian House Die. Fist I made a New House by cutting the die with different coloured card and cutting different sections off and layering them, as the windows and door open with this die I put behind them a small patterned design paper so it looks like wallpaper. 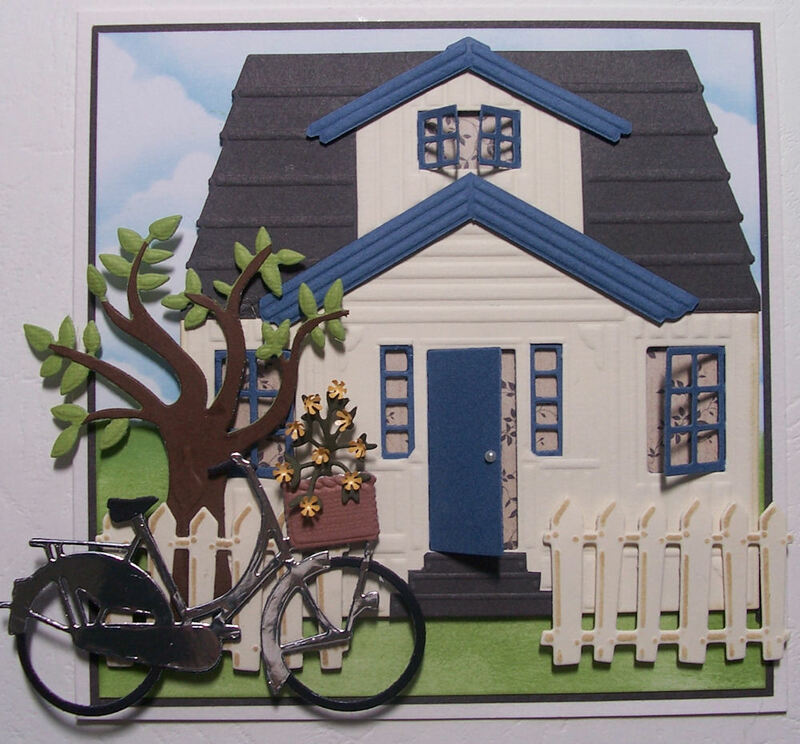 The tree, fence, (out of stock) leaves and bicycle are also all Marianne Creatable dies. The background behind the house I made by inking over some cloud shapes with a sponge and the Memento Summer Sky stamp pad, grass was done the same way with a turn piece of cardboard and Bamboo Leaves memento ink. For The Old House I just cut it out with a white core card and sanded it. Again the Bicycle, Fence, leaves and sign are all Marianne Creatable dies. The little owl in the top window is a button with the shank cut off. Many thanks for taking the time to visit, I really appreciate it.